We used to host exchange students and one year, we hosted a young man from Jedda, Saudi Arabia. After he’d been with us a couple of months, he asked if it was OK for his aunt to visit from Canada. We were happy to oblige and she arrived in due time. We learned she had fled an abusive marriage in her country, leaving with her kids and starting over on her own in another country. She was no shrinking violet. Eventually, she started Zena Caffe in Toronto on Church Street, which is the equivalent of New York’s Times Square. It’s in the heart of the gay community, just off Dundas Square. It was a colorful business – quite normal during the day, and with a loyal clientele of transvestite performers coming in after hours. She learned how they tied their parts back to pass for females, and other trade secrets. She sold the place a few years ago. I don’t know if anything remains. She had been asked by her brother to look in on his son (our student). And, although she hadn’t seen either of them in over a decade, she came to the Twin Cities to check in on him. On her first night in town, she showed us how to make Thai Peanut Sauce. We’ve used it ever since. This makes about twice what you need on a pizza. Use the rest on noodles. 2. Chop chicken into smallish chunks and stir fry 3-5 minutes in about ¼ cup of peanut sauce. (I do this instead of marinading chicken in peanut sauce overnight before cooking. Do it your way). Bake the pizza for 10 – 12 minutes or until the crust turns brown. Mmm. Peanut sauce. And pizza. Wow, what a story, I mean wow. Thanks for sharing that, because if it were not for people that one meets or hosts, you would not have these bits of genius shared. Glad you enjoyed it – I’m with you on the sharing – we learned so much from our students over the years. I’m just starting to find them on Facebook too. Love the story. 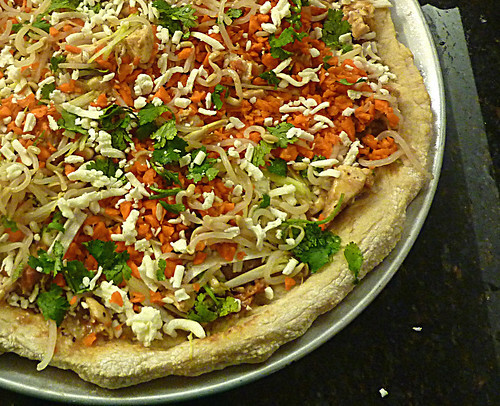 The pizza looks fantastic – never thought about peanut sauce on a pizza… but I’m gonna try it next time! 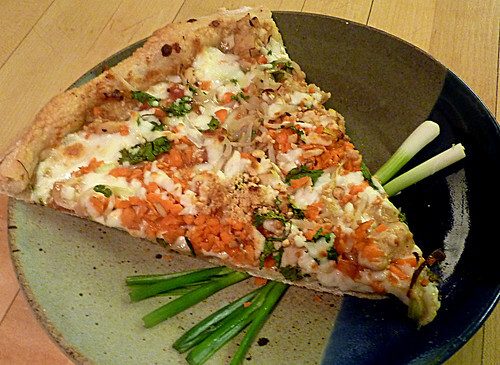 You have to know the Italian in me is wondering, “Peanut sauce on pizza!?? ?” But you know – I love peanut sauce – so why not! I love the tale. Life can be amazing and you just never know which road will lead to where. Whenever we try a pizza that’s exotic I always make a pepperoni pizza as a backup. That way, we get leftovers too. gorgeous looking pizza! and an interesting story! Very interesting pizza. Love the photo! Great story. Love it. Pizza looks delish too. Loved the story,the pizza looks yummy. Awesome story! Recipe sounds good, too!! Sounds interesting… Something I would try. Oh yum. For me, it goes well with anything. Wow, interesting flavors, but an even more interesting story! Love it. This looks so good and I love the story! What a remarkable woman! What a different and delicious idea! …The things you can do with pizza, love it! what a nice little story, and pizza looks fab! 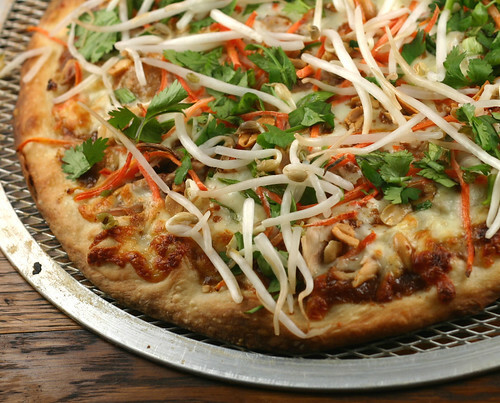 Thai inspired pizzas are the best! Great story and very clever pizza! thanks for sharing the story! a very touching and meaningful one. thanks for the sharing the recipe too! just a bottle of thai beer, i’m ready to go! Looks great! Is it just me or is the recipe truncated at step 3.c of building the pizza? Thanks Stevo – sometimes I don’t read everything that’s sent to me all the way through and it gets me in trouble. I’m opening Jp’s original and adding the rest right now. The even sadder part is, is that I made this pizza this weekend (delish), saw that it ended abruptly and didn’t investigate any furthur.